Work supporting devices play an important role in the machining of the work piece on lathe machine. Although the work may be held in the work holding devices still sometimes it is not possible to machine the job without having been supported by some means. These devices are used for supporting the job on a lathe. (a) Nose or Point. Nose or point is the front pointed portion having 60° angles. Its point is hardened if it is dead centre but in case of live centre the point is not hardened. It is made smooth by grinding. (b) Neck. Neck is the plane portion from the taper of nose. In some of the centres this neck is made to house the spanner. (c) Shank. Shank is the tapered portion after neck. It fits in the taper hole of spindle of headstock or tailstock. (d) Tang. Tang is the parallel step after taper. It saves the taper when it is taken out of the spindle by hitting. (a) Live Centre. Live centre is one, which is fitted in the head stock spindle. The live centre always rotates with the work. It is made of high carbon steel and generally its nose is not hardened. It is smaller in length than dead centre. (b) Dead Centre. The one, which is fitted in the tailstock spindle is called dead centre. The dead centre remains stationary and the work revolves upon its nose. It is made of high carbon steel and its nose is hardened because it is subjected to friction. It should be remembered that dead centre should always be lubricated with grease or compound having 65% grease, 25% chalk, 5% Sulphur and 5% Graphite. This compound reduces the friction on the nose. (a) Plain Centre. It is used for general turning. (b) Pipe Centre. When pipe is to be turned or threaded, this centre supports the pipe. (c) Half Centre. When any long work is to be faced this centre is used. (d) Square Centre. This type of centre shown in Figure 5.3 is fitted in tailstock and is used in rectifying damaged centre holes of previously finished jobs, which might have been damaged due to hammering etc. Square centre has four longitudinal flats forming four square edges at the nose with 600 included angles. At the time of rectifying the centre hole, the square centre should be fed slowly and the coolant should be applied for keeping the edges cool. (e) Hollow Centre. It is used for holding a job, which does not have the centre hole; also it can be used for those jobs whose taperness is ending in a sharp point. (f) Tipped Centre. The tip of these types of centres is made of tungsten carbide. These are used when the work is to be turned at high speed or the material is very hard. (g) Stepped Centre. This centre is used for holding the job, which has big countersunk hole or counter bored end. (h) Ball Ended Centre. This centre has round nose. It is used when taper is turned between centres and the tailstock is off set. The round nose does not spoil the centre of the job when the tailstock offset works efficiently. (i) Revolving Centre. The revolving centre is used where machining is done at high speed because the dead centre cannot stand the friction and wears very soon. Revolving centre rotates with the job so it becomes live centre. In some cases, the revolving centre does not have sufficient rigidity for turning heavy work at high speeds. Due to less rigidity vibrations in the work piece may occur. To do such a job efficiently a build in roller bearing centre is used. It is fixed in the tailstock. (j) Lubricating Centre. In this centre a provision has been made to keep the oil in the cup, which lubricates the point of centre. (a) Fixed Steady. The use of steady is recommended when a long job is machined or drilled at its end by a drill. A steady rest can be used to give support to the work and thereby avoiding the chances of work piece deflection. Figure 11 shows the steady rest. This rest is fixed at one position in the bed. It has a locking unit, which consist of a clamping plate, nuts and bolts. It has three fingers and the ends of the fingers are provided with pads of brass or bronze. These brass pads provide the bearing to the job. The fingers should be adjusted in such a way that these are not too tight against the work. The fingers should be constantly lubricated throughout the operation. (b) Follower Rest or Travelling Steady. 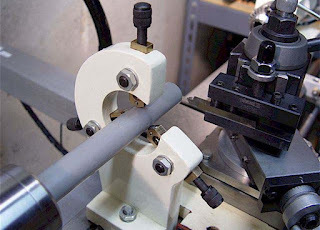 While turning a long and thin cylindrical job between centres, the follower rest is used to prevent the work piece from being turned out of line due to the pressure of the cutting tool. It is called follower rest because it travels with the cutting tool. It is connected with the carriage and follows behind the tool, bearing on the freshly cut surface of the job. It should be borne in mind that the surface where the two fingers will support the job should be smooth, so that the brass pads are not spoiled and it should have smooth running. It should be lubricated throughout the operation. (c) Roller Steady. It is practically similar to fixed steady. The only difference in it is that it has three revolving rollers in place of three jaws with brass pads. This steady gives support to work and has no friction in rotating due to rollers. Figure 5.13 shows a roller steady. (a) Plain Mandrel. It is solid and cylindrical in shape. It has centre holes on both the ends. It is ground and has a taper of 0.5 mm per meter on its length. The mild flat portions at the ends enable the screw of the lathe carrier to have a grip on the mandrel. The taper is kept to have an easy fitting on the job. It is generally used for turning of gear blanks. (b) Collar Mandrel. It has a collar at one side. It is used for mass production work. The collar works as a stopper and the correct length can be maintained with the help of dial of the carriage. (c) Stepped Mandrel. This type of mandrel has three or more steps. It can be used to turn the jobs having different sizes of holes, which correspond to the step diameters, e.g. bushes of different diameters. This avoids using many mandrels for different hole sizes of bushes. One mandrel can work for as many numbers of jobs as there are steps in it. (d) Cone Mandrel. It has two cones, one cone is fixed and the other one sliding on the mandrel which can be tightened by a nut keeping the job between two cones. (e) Taper Mandrel. This mandrel has a taper and one end has threads on which the nut is tightened to hold the job. These mandrels are made in different tapers. (f) Threaded Mandrel. This type of mandrel has threads formed on it. It is used for machining threaded jobs. These are made in various sizes to suit the different type of threads of the components. (g) Expansion Mandrel. These mandrels are used for holding work in which the variation in the hole may reach 0.5 to 2 mm. The expansion mandrel consists of a taper body with two threaded sections as shown in figure 21. A spring sleeve and two nuts provided to fit on the body. Parts of this mandrel are shown in figure 22. The spring sleeve has a tapered hole, which fits the taper of the body. The work is clamped due to expansion of sleeve when it is tightened by the nut. Flat at the end is provided for dog carrier. These mandrels are generally used for turning gears, couplings and bushings, etc. (h) Stub Mandrel. There are two types of stub mandrels. One is stub- threaded mandrel and the other is stub expansion mandrel. The stub- threaded mandrel is used to mount work on a threaded hole for external turning and finishing.